To Sum It Up: Seventeen-year-old Josephine Alibrandi is in her final year of high school at St. Martha’s and planning to study law. It’s not just her imminent passage into adulthood that’s weighing on her mind, though. There’s her complicated relationship with her tradition-minded grandmother, who’s such a domineering presence in the lives of both Josephine and Josephine’s mother. There’s also the sudden appearance of her father, who’s been absent all her life until now. Finally, there’s Jacob Coote, a public school student who literally drives Josephine crazy at times. Although she knows it’s going to be a challenging year, there are still some unexpected events that nothing can prepare her for. Review: I’ve fangirled big time over Melina Marchetta’s novels on a few occasions now, so it’s a no-brainer for me to want to read everything she’s ever written. 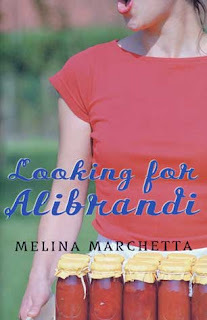 Originally published in 1992, Looking for Alibrandi is Marchetta’s debut. When I first found out the publication year, I had to laugh a little because waaayyy back in 1992, I was a Catholic high school student, just like the book’s protagonist and narrator, Josephine Alibrandi. Even at the old age I am now, I couldn’t help but feel a bit thrilled to share something in common with a Melina Marchetta character. Geeky? Yes, I know I am. Despite heading into this book feeling like I already had a connection with the main character, I didn’t find Looking for Alibrandi to be on the same level as Marchetta’s The Lumatere Chronicles or Jellicoe Road, the other Marchetta contemporary that I’ve read. I feel like I just committed the ultimate sacrilege in saying that, but I couldn’t find the pure love for this novel that I have for some of her other ones. I don’t want to give you the wrong impression here, especially if you’re a huge Marchetta fan like I am. Looking for Alibrandi is nowhere near being a bad book; I just don’t think it’s quite as seamless as her later works are. Sometimes it seemed to me that Looking for Alibrandi couldn’t figure out exactly what its focus should be. Sure, it’s a character-driven novel and Marchetta’s characters are as expertly constructed as ever, but I didn’t always find the transition from one plotline to another to be smooth. There were a few times when I started a new chapter and felt as though I had missed something from the previous one. I thought the strongest story lines revolved around Josephine’s evolving, and occasionally stormy, relationship with her very traditional grandmother and the tentative one that develops between Josephine and the father who’s been a total stranger to her for seventeen years. Marchetta is at her best in depicting both how complex family ties can be and how powerful the love that comes from those same ties can be. I wish I could say I was as keen on Josephine’s relationship with Jacob Coote, her on-again/off-again love interest. These two have a serious love/hate thing going on, and I just found it more frustrating than endearing. Josephine is a rather selfish character with a mouth that often doesn’t know when to keep quiet, but those are the qualities that make her so real. I can never emphasize enough how multi-faceted Marchetta makes her characters. They’re not perfect, but that’s why you love them. Their flaws make them human. I didn’t really care for Josephine’s grandmother for a long while because I found her overbearing, but you discover later on that there’s so much more to her than her stories about her life when she first arrived in Australia from Sicily. I wanted to hug this woman by the end of the book and tell her that I misjudged her. Yet again, Marchetta’s characters surprised me. While Jellicoe Road remains my Marchetta contemporary of choice, Looking for Alibrandi isn’t without its merits. The character development is brilliant as usual, and the writing itself is sharp. The sometimes choppy pacing and abrupt switching between plotlines kept this from becoming an instant favorite of mine, but I can say with absolute certainty that these are not issues I encountered while reading Marchetta’s later novels. All in All: To put it simply, I liked this, but I didn’t love it. And believe me, it’s so tough for me to say that I didn’t love a Melina Marchetta novel. This one fell a tad short for me, but it’s definitely still worth reading if you’ve enjoyed her other books. I hate it when you don't love a book by an author you usually love..always feels so disappointing! It does. I feel pretty bad for not finding this a 5 star read because I loved the other books I've read by her so much, but I just couldn't rank this one up there with them. I've read Jellicoe, Saving Francesca and Piper's Son but not this one. I've been meaning to read it! I will brace myself for a maybe disappointment. At least it was still enjoyable, and might kind of show how much her work has improved! For sure! The characters and dialogue in this one are well-written; I just felt there was something slightly off about the book's overall flow, which is something I never had a problem with while reading her other novels. I think you'd really enjoy her fantasy series, The Lumatere Chronicles. Those three books are all phenomenal, from the characters to the world-building. I'm so sad that the series ended this year, and I really, really hope she decides to write more fantasy in the future because she's soooo good at it!